Posted by Joanne Eve Fraelic - PsychicChoices.com in Upcoming Events. Visit me for the 37th annual Christmas In The Manger Craft Show at the Saanich Fairgrounds on November 26th & 27th. I’ll be in the main building from 10am to 4pm on both days – come talk to me about the healing properties of crystals and visit over 135 other exhibitors at the same time! I will be at the Creative Craft Fair at Pearkes Arena from November 11th, 12th & 13th. This is the show’s 34th year, and with over 100 exhibitors this year, you’re sure to find that special gift for everyone on your holiday list! Come on down, I’d love to meet you and teach you about the healing properties of minerals. You can click here to find more information on the Creative Craft Fair website. Connect to your spiritual path and soul journey, discovering your Goddess within, then to the soul of planet earth, then onward to the INFINITE COSMOS! 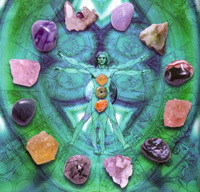 Of course learning & experiencing about sacred crystals and earth gems is a must. We will be doing sacred meditations, ceremony fires evenings, healing circle daily, spirit boards, aura readings including 22pgs of info, natural & vegetarian food provided, group healings, and so much more. There is only room for 11 people and a blessed 6 people to stay on site. You will know if you are meant to attend. Please click here to contact me if you’d like more information or if you’re interested in attending! Posted by Joanne Eve Fraelic - PsychicChoices.com in Random Updates. Thanks to my friend Aeoliah, who took this lovely photo for me at the Old English Inn.